How often should you have your rack inspected? Who should do it? If you operate mechanical handling equipment, it's critical to inspect your pallet racks. They are excellent storage equipment, but when damaged or incorrectly loaded or installed, they can become dangerous. It's flat-out smart business to engage in regular inspections. The process will not only help you comply with safety regulations and work safer, it will help you spot poor practices in your operation that might otherwise go unnoticed. The modern pallet rack is a sturdy workhorse capable of holding its listed capacity - as long as you don't overload, mis-load it, smash a forklift into it, or otherwise abuse it. Nothing abuses a rack upright like a forklift impact. These systems can support a lot of weight, and take it up high into otherwise unused warehouse space. This is all to the good - but what if an upright has been compromised and you don't know about it? Drivers are not likely to report collisions, so you may not know if a rack has been compromised. Because people can die in a rack collapse, and because you can dump tens of thousands of pounds of inventory worth potentially tens of thousands of dollars even if you are fortunate enough to avoid injuries or fatalities, rack inspections are always a good idea. If you know of a damaged upright, replace or repair it - don't wait for an inspector to tell you. New uprights are inexpensive; rack collapses are not. Train someone internal to your company who doesn't typically work the warehouse to do this job, if you do it internally, or to do spot checks between professional inspections. The RMI (Rack Institute of America) has many resources for rack users. Even if you hire a professional inspector, you should also make periodic self-checks of your pallet racks. Are the racks plumb and level? This is an issue with rack systems that have been reconfigured, poorly installed, or in areas where there may be foundation settling. The floor may have been inadequate and the rack installed with extensive shims, which can move and skew. Collisions may have a greater impact on racks that aren't set level. If you see crooked racks, rows out of alignment, or vertical leaning, consider it a red flag. Are any metal component rusted or corroded? This is worth noting as it is an indication of potentially weak metal beneath. If paint is scraped, a rack may have suffered a collision. Is the rack overloaded? This question can’t be answered at a glance, but overloading is a prime cause or rack failure and the catastrophic damages & injuries that can follow it, so it needs to be addressed in any good inspection. It is an easy mistake to make and it’s made far too often. If the rack is older, it may not have capacities stamped or posted on it. Changing the load without checking capacities is a serious issue. Remember that beams have rated capacity per pair, and that uprights depend to a great degree on beam spacing for their capacity ratings. Visit your rack supplier’s technical documentation to find those ratings for your pallet rack. Uprights: Are they Bent or Damaged? Do they have paint scrapes that might indicate a forklift hit? Damage, no matter how minor in appearance, can reduce the upright capacity for its section of the rack. Replace or repair these uprights immediately. Check the horizontal braces for any bending, twisting, or other damage. Check your footplates. Are they properly lagged and securely attached to the floor? Are column protectors damaged? If they are, remove them and be sure the rack upright didn't also take damage in the incident that damaged the protector. How bad is the damage? To check, measure the gap. Place a steel straight on the surface of the concave side of a damaged rack upright. The straight edge should be centered on the damaged section’s length as accurately as possible. This allows you to gauge the gap distance. We recommend that you err on the side of caution, but this procedure is used in the United Kingdom, to determine if the gap is more than 3 millimeters, which is the minimum safe standard there. 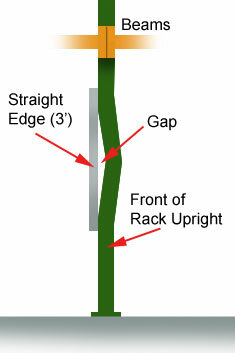 For an upright bent parallel to the direction of the rack’s beams, the maximum gap between the upright and straight edge should not exceed 5mm. This guideline applies only to damage that produces an overall bend in a member, not to dents, buckles, tears or splits. Any damage to an upright may be cause to replace or repair it. Like the upright, beams can suffer damage from impacts (either from forks, or from pallets), or by overloading. They can be knocked out of secure fastened position or either overloaded or misloaded, leading to failure. Check for damages: If beams are dented, twisted, dinged, or even scraped, check them for damage. Replacing a beam is easier and cheaper than the alternative of a collapse. Check for deflection: Beams naturally deflect beneath a load, and a certain amount of deflection is acceptable. It should disappear when you unload the beams. If it doesn’t, you should replace the beams. They have been deformed by overloading or impacts. In any case, beams shouldn’t bow more than 1/180th of the total length of the beam (for a 96” beam, that’s half an inch). Are the beams properly attached to the uprights? Inspect the connections. Are the beams seated tightly into uprights? Has there been impact to the area? Are there broken welds or other signs of damage? Are safety clips still tight; are bolts on bolted systems still tight? Are the clips, bolts, or safety pins, or beam attachment pins missing or damaged? Most racks use some kind of connector hardware aside from the teardrop or keyhole to ensure tight fit and safety. Some even utilize more than one of these methods. Inspect yours to make sure they are all securely fastened and undamaged. Replace the missing or broken ones (if it’s broken pay special attention – what broke it? ), and tighten the loose ones. Just doing the inspections isn't enough - you must document and take action when needed. Documentation helps you track the regularity and thoroughness of the inspection process in the event of any future issue. If you hire an inspector, be sure he adheres to industry or local code standards, and that he also documents and retains the records of his inspections. Please note that these tips are just for informational purposes; see a rack inspection professional to ensure that your facility is safe and that your rack is in no danger of failure.